Outdoor garage lighting can be a useful and decorative way to show off the eye catching beauty of your outdoors. Whether your garage is detached, attached, one car, two car, or three car, you'll find out how garage lighting can work better for you. Motion sensor outdoor lighting on a garage is not new to anyone, but it is convenient for garage lighting. Most people think of motion sensor light fixtures as not being very decorative. Although this may be true for most attached motion sensor lights, you can always choose a remote motion sensor and link it to any decorative outdoor lighting fixture you choose. Overall, outdoor motion sensor lighting is a great garage lighting fixture because its simple to use and effective for most applications. Outdoor wall mounted lighting fixtures can be a good choice for your garage lighting needs because of their decorative appeal. They can add that finished look to your garage you've been missing. Because most wall mounted light fixtures are decorative, they can be used to compliment or mirror your existing outdoor lighting fixtures. Its easy to add a remote motion sensor to your lighting fixtures, making your decorative wall mounted fixtures operate on motion detection. You can really get creative with outdoor recessed lighting fixtures especially if they're your main source of outdoor garage lighting. Planning and preparation are key here since recessed fixtures need to be set into your garage's frame or surrounding environment. Installation may be more of a hastle since you may need to run cables in oddball locations. You'll possibly need to cut out small sections where you want the recessed lights to sit so that they sit nice and flush. It may be easiest to hire a professional to ensure that the outdoor lighting installation goes smoothly. Make sure there is adequate drainage for your outdoor recessed lighting fixtures. Proper drainage is necessary to prevent your recessed lights from shorting out. Here are a few ideas to get the juices flowing. Get creative and have fun with it. Use recessed lighting for grazing your garage door, exposing the interesting design or intricate patterns engraved in it. It'll help bring out the door's character and show off its beautiful lines. You may also decide to hide your recessed lights and install them along your garage's side posts. Adjacent to the garage door. Got a new garage? Show off it's construction by surrounding it with recessed fixtures to show off its overall beauty. Never pull up to a dark garage or driveway again. 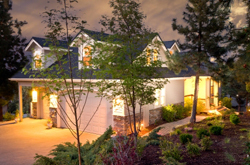 Remote control outdoor lighting gives you full control of your garage lighting when needed. Think of how easy it would be to pull up to your garage and have your lights turn on. A remote control sensor enables you to enjoy this freedom. With the push of a button your outdoor garage lights turn on from inside your car. When you get into your house, another push of a button and your garage lights are off. It would be best to install the sensor inside your garage. That would keep the sensor clear from exposure to the outdoor environment. An outdoor lighting timer is a great way to ensure your outdoor garage lights turn on and off on a set schedule. Most people are familiar with the type of timer where you set it and forget it. That might not be the best solution for you because once its set people forget and so will you. They even forget to change the timer as the seasons change. Therefore you'll constantly need to adjust it for the season changes. So much for setting and forgetting it. For people with this problem, its best to buy a timer with multiple time settings. That lets you change the time that you want your lights to be triggered. The time setting can be adjusted to change each month, week, or day if you wish. That way you can adjust it to change what time your garage lights turn on seasonally. That will ensure you can trully set it and forget it, so you'll never have to pull up to a dark garage late at night again.